Some health issues are more serious than others. An example of an extremely serious health issue is diabetes, which is an all-too-common condition in the United States. The C.D.C. reports that more than 29 million Americans have diabetes; unfortunately, one out of four of these individuals don’t even know they’re suffering from this illness. Even more frightening, another 86 million adults have “prediabetes”. This means that one out of three adults currently have higher than normal blood sugar levels, which could soon increase and lead to another case of diabetes. As we face these high numbers of diabetes and prediabetes cases, it’s important that everyone in the country learns as much as they can about recognizing and preventing diabetes. This knowledge will allow individuals and entire families alike to support each other in their efforts to live healthier, diabetes-free lives. And seeing as April is Defeat Diabetes Month, now is as good a time as any to discuss the specifics about this serious illness. What Is Diabetes? Diabetes is a chronic disease that results in high blood glucose (or blood sugar) levels. These elevated blood sugar levels – also known as hyperglycemia – occur because diabetic patients cannot make or use enough insulin to naturally manage their blood sugar levels. 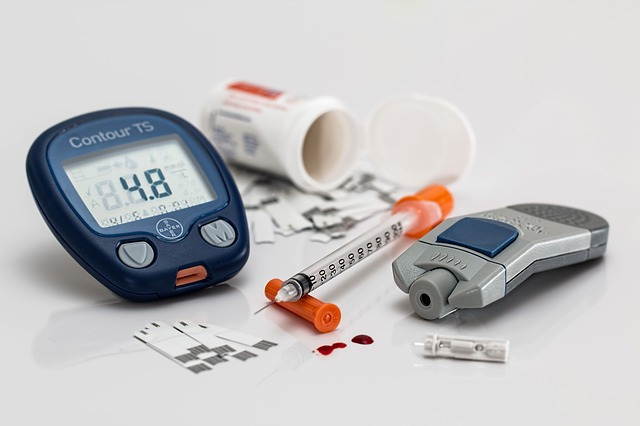 Because of this, diabetic patients need to take steps to manage their blood sugar; otherwise, they’re at a higher risk of suffering from the symptoms or side effects of hyperglycemia, which range from feeling weak, to suffering from vision problems, to experiencing nerve damage. Gestational Diabetes occurs when a woman’s body is unable to produce enough insulin to regulate blood sugar levels during a pregnancy. This type of diabetes occurs during roughly 4% of pregnancies in the United States. While this illlness is usually temporary, it’s important that pregnant women undergo testing for gestational diabetes during their doctor’s visits so that they can receive proper treatment; otherwise, their elevated blood sugar levels can lead to growth and development problems in their children. Type 1 diabetes, also known as insulin-dependent diabetes, is known for developing in children and teenagers, although it can affect any patient at any age. Roughly 10% of diabetes cases are type 1 diabetes. Individuals who have a family history of type 1 diabetes, who have suffered from pancreatic disease or infections or illnesses that affect the pancreas, who come from certain ethnic backgrounds, or who experienced certain difficulties during their early childhood are more likely to develop type 1 diabetes than the average person. Type 2 diabetes most commonly affects adults over the age of 45; however, as childhood obesity becomes more prevalent this disease is developing more often in teenagers. It’s the most common type of diabetes, and makes up roughly 90% of diabetes cases. Unlike type 1 diabetes, patients with this type of diabetes develop a resistance to insulin. There are a number of factors that can increase one’s risk of developing type 2 diabetes. Patients who are overweight or obese, who have high blood pressure, who live a sedentary lifestyle, who have a relative who has diabetes, or who have (or previously had) gestational diabetes are at a higher risk of developing type 2 diabetes than the average person. Patients who already have an impaired glucose tolerance (also known as prediabetes), who suffer from insulin resistance, or who come from a specific ethnic background are also more likely to develop this type of diabetes. However, it’s important to note that many diabetes patients – whether they have type 1, type 2 or gestational diabetes – do not display symptoms of the disease when it’s first developing. Because of this, regular testing is the key to determining whether or not you have diabetes. While these facts can seem frightening, the good news is that you now have the facts about diabetes. This means you can begin taking steps to help reduce your own risk of developing this disease. Get moving. Exercising 30 minutes or more, at least five days a week, is one of the best ways to reduce your risk of developing diabetes. Exercise is beneficial because it helps patients lose weight, naturally lowers and maintains blood sugar levels, and boosts the body’s sensitivity to insulin, allowing your body to properly manage its blood sugar levels. Both aerobic exercise and resistance training can help patients lower their risk of developing diabetes. Maintain a healthy weight. In many cases, being overweight or obese is the number one trigger that sets off the development of diabetes. Fortunately, maintaining as healthy a weight as possible will go a long way in reducing your risk of developing diabetes. Eat right. Eating a healthy diet is also extremely important in diabetes prevention efforts. That means you should aim to eat plenty of fruits, vegetables, whole grains, nuts and seeds, as opposed to sugary drinks and snacks. To gain all of the benefits a healthy diet has to offer, make sure that you follow current guidelines on healthy eating, rather than older ones that you may have learned when growing up. These three basic preventative steps are important ones that anyone can take to reduce their risk of developing diabetes. If you want to learn more about what you can do to reduce your risk, the American Diabetes Association has many additional tips, tricks and informational guidelines about lowering your risk for developing diabetes. You can also schedule an appointment with your doctor here at Genesis Medical to review your personal risk level and develop a highly personalized healthy living plan that will ensure you’re doing all that you can to reduce your risk of developing diabetes.